For many, thinking about lacrosse conjures up images of young white jocks hacking at each other with sticks on the rolling green campus of a New England prep school. But stick-and-ball games like lacrosse were played for centuries throughout the pre-colonized Eastern Woodlands and Great Plains. While lacrosse is now known for being the domain of dudes from Duke, the indigenous Mohawk tribe from the land that’s now Canada and the Northeastern United States are credited as the originators of modern lacrosse, though the exact date of origin is unknown. The film centers on four players: team captain Tsieboo Herne, goalie Marcella Thomas, and offensive players Jacelyn and Mimi Lazore, sisters who are recent transfers from Salmon River’s bigger and whiter crosstown rivals, the Massena Central High School Red Raiders (seriously). Though they all have different stories, the girls share the traumas of colonization and forced assimilation. For each, lacrosse has become a means of reasserting her self-worth and honoring her culture, an act of resistance against white supremacy, sexism, violence, and depression. In Akwesasne Mohawk tradition, lacrosse is a medicine game meant to heal. The beautifully stark cinematography of the film underscores the sacredness of the sport. 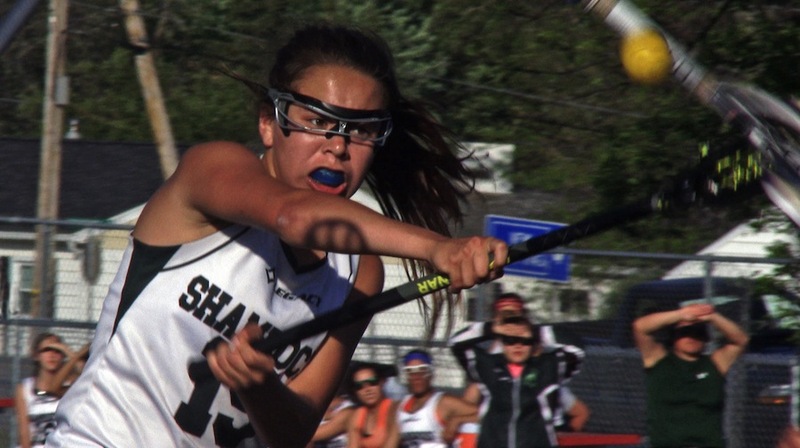 Traditionally, the sport was only played by men, and the central tension in the film doesn’t revolve around the outcome of the team games but rather the deep ambivalence the community feels about the girls playing lacrosse at all. While the girls on the team see lacrosse as the game of their people, their ambitions are met with opposition. 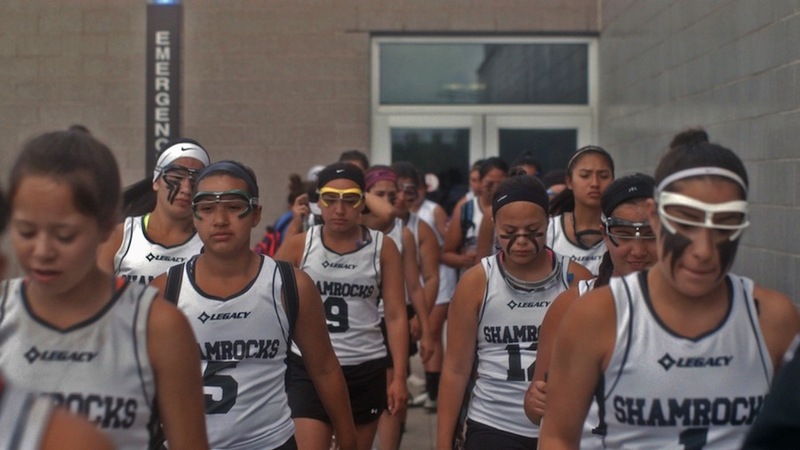 “They see us playing lacrosse as a joke,” says Jacelyn Lazore. And indeed, as a group of local boys watches the girls play while waiting for their own practice to begin, they express their scorn for the girls team. “It should be a men’s sport only. Women used to never even be able to even lay hands on a lacrosse stick,” says one. “Weren’t allowed to touch it,” pipes in another, shaking his backwards-capped head as if longing for the good old days. As the film progresses, the girls do gain more support. Eventually, clan mother Herne gives the team her blessing, telling them, “You represent your mothers and grandmothers who didn’t have the chance to place this game.” While the movie follows the course of a season’s highs and lows, Keepers of the Game is just as much about acknowledging and healing from the erasure of Akwesasne history. Can the success of this team make good on centuries of genocide and disenfranchisement? No. But can a group young women taking their healing into their own hands unite and change their community for the better? I believe so. Salmon River High School’s cultural specialist and Mohawk language teacher Katsitsionni Fox notes, “When my mom came to school here, you’d get punished for speaking the Akwesasne language.” Since then, the community has come a long way. Radio host Maureen Cook, who covers the girls lacrosse team on her show says, “[Now] Salmon River is fielding a girls varsity lacrosse team. That was something that we never had when I was at Salmon River.” Though the girls are the vanguards of a new era in their culture, they are bolstered by this generation of older women who will share in their healing. Clan mother Herne, one of the most commanding presences in the film, explains it best as she drives down a snow-covered road in the grey Northeastern winter. “Lacrosse was brought to us as a gift to lift the minds of the people, and our people have been hit with a lot of hopelessness,” she says, driving by signs and billboards with slogans like “Gambling Is Not Our Tradition” and “Take Back Our Rez No Drugs No Dealers.” “We’re fighting to regain our identity…our language, our ceremonies, our ancient sounds, our dances, our way of life.” As she mentions the disenfranchisement Native people face, a hand-painted sign appears by the road: “INQUIRY MISSING MURDERED INDIAN WOMEN.” It flashes on screen for only two seconds but is chilling in its brevity, and it is the only mention of the epidemic of missing and murdered Native women throughout Canada and in the United States. While Keepers of the Game does a great job of exploring the crises of identity each girl faces, it makes almost no mention of the violence Native women in particular face, including widespread violence committed against them and scant media coverage of these crimes. It’s clear throughout the film that these women are all fighters and survivors, but small visual cues such as the signs by the side of the road hint at the fact that we are only scratching the surface of their story. Watching this film, I felt privileged to have the opportunity to learn these girls’ stories and more about Mohawk culture and traditions. However, the sadness of the film is inescapable as well. These girls have to fight so hard not only to play their game but to hold onto their identities. Their resilience and grace under pressure is inspiring. Keepers of the Game is a deeply emotional film that achieves what only the best sports movies do: showing how sports can build communities and individuals up to resist the woes the rest of society throws at them.